A sunny spot with room to spread. The roots often spread several feet in the course of a season. Horseradish is a hardy perennial that will survive winter even in very cold climates. Potatoes. Usually horseradish should be planted by itself. Set out roots any time that the ground is not frozen, preferably from early spring to early summer. 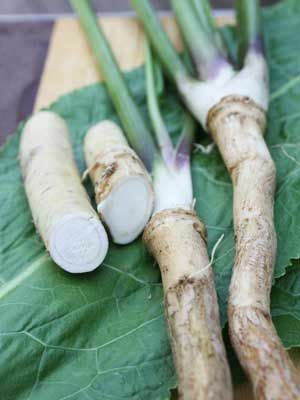 Persistent and long lived, horseradish can become invasive if you accidentally allow pieces of root to be spread around the garden. Dig roots anytime you need them in the kitchen. Keep scrubbed roots in the refrigerator. Horseradish seldom has problems with insects or diseases.